A successful car lift business is built on facts, not vague or empty claims. Nonetheless, there’s a lot of industry swash-buckling over who makes the safer lift. This in-fighting results in a lot of misinformation and exaggerated marketing claims. We’d like to clear a few things up. The following 8 statements are all false regarding 2-post lifts. We see these claims all over the internet via forums, our competitors’ own websites and emails to our sales/customers service representatives. It can be hard to trace the origin of certain myths, so without direct finger-pointing or naming names, we’ve picked out some of the top false claims we still hear about two-post lifts. 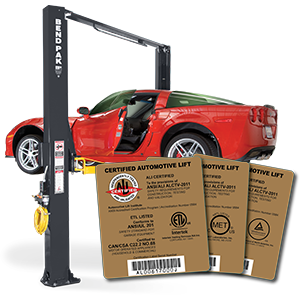 An Automotive Lift Institute (ALI) certified car lift must pass the same ANSI/ALI ALCTV-2017 standard in all 50 states of the United States of America. No matter the source or origin of the steel, and no matter who welded it or where (by man or machine), the standard is always the same. Some companies with severely jacked up prices try to prey on your emotions by convincing you a BendPak lift is unsafe, or that their lifts are "more safer" because "X-Y-Z." (We’ll go more into the specifics of X-Y-Z later in this article.) It’s all boloney. The only reason this lie exists is because outdated technologies and equipment end up costing our competitors’ more to produce a single lift. They have to justify that extra cost to you somehow. 150% load with no visual deformation of the lift’s structural elements or components. Rigid environmental quality control requirements for manufacturing and shipping facilities. Structural integrity testing of every single system and component for proper function of controls, load-holding systems, lowering speeds, overload protection and more. Put it this way. If you see that ALI Gold Label, certain bare minimum requirements have been met, and those minimums don’t come easy. BendPak is proud to over-deliver and over-engineer on plenty of ALI baseline standards, but we proudly rest on the extreme level of safety offered by that Gold Label. There’s no better way to validate the safety of a lift. This one is interesting. A lot of customers see a certain well-known brand, fully ALI certified, with columns that are bulkier and heavier than other certified brands. Let’s call them Company X. Customers are told that this company’s lifts are sturdier and more reliable because—well—just look how BIG the columns are! Here’s the truth. Those big, fat columns made by Company X will not raise their rated load one bit safer (or longer) than any other certified lift product. All ALI/ETL certified lifts feature columns that are capable of safely supporting a minimum 3x their rated load capacity. Company X is not using more steel because they’re making safer lifts; they’re just using the same technologies and manufacturing techniques they used back in the 1970s. At BendPak, how we engineer a car lift means more than how many pounds of steel go into it. Don’t believe the hype about super-thick columns. To illustrate our point, check out this video, in which a heavier older car goes head-to-head (literally) with a later model. The results are... predictable. It goes to show that heaviness doesn’t automatically mean safety. Most ​automotive lift manufacturers have made the switch from lift carriage roller bearings to slide blocks. Although heavy chains with roller bearings sound impressive, these systems have significantly more moving parts and will ultimately require more maintenance and service than newer, Direct-Drive lift designs that employ UHMW slide blocks. 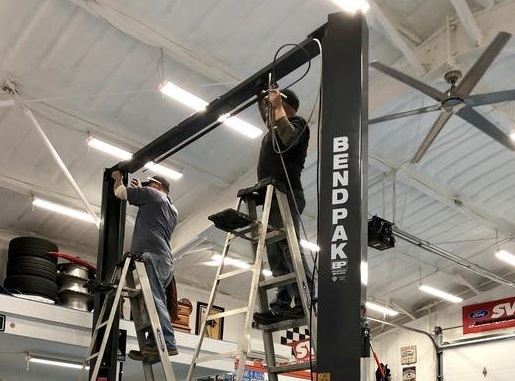 We have firsthand knowledge to support this because early BendPak lifts (branded Pro-Lift™, 1984-1990) used forklift channel and mast bearings. Anyone with a big grin on their face trying to sell you the benefits of roller bearings is selling you nonsense. However, there is one instance in which roller bearings are necessary, and that’s on some low-rise columns. A cylinder would stick out the top of the lift as the carriage rises, so Direct-Drive cylinders wouldn’t be useful in this particular circumstance. Equalization cables are a fixture on all BendPak two-post and four-post lifts. These rugged, aircraft-quality wire cables are fitted into oversized, friction-reducing cable sheaves. If your lift doesn’t come with equalizing cables (consider the sheave dimension as well), you will have leveling issues. It’s not unknown to us to have customers trade in their X-Y-Z brand lift for a BendPak brand. They make the change because our claims are consistently verified by operators in the field. This one is self-evident: dual-point release locks are not convenient. Any ​auto lift company bragging about how easy it is to manually release the lock points on each column is missing the bigger picture. BendPak locks are single-point release, which means both locks simultaneously disengage when you raise the lift. These other companies are also hiding one very important fact: dual-point release locks are an outdated technology. It’s a lazy, cheap design feature that should have left the industry years ago. The holdovers are hoping you don’t know any better, and apparently they get away with it often enough to continue with their old ways. Don't buy a lift by the pound. Consider benefits, state-of-the-art engineering and design, features and specifications. Weight is only one aspect. For instance, we see a lot of non-certified lifts rated for 11,000 lbs. They probably want to compete with our 10,000-lb. capacity models and appear “safer” because of the extra 1K. Not only does a lack of certification throw into question how they’re coming up with their numbers, but weight does not relate to safety. 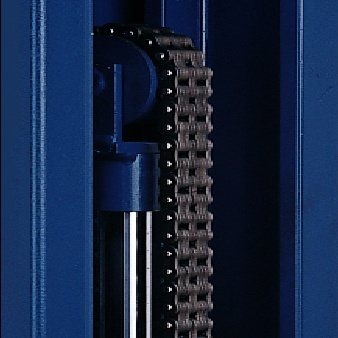 What does relate to safety are features such cable slack detection (present on all BendPak lifts), equalization cables with friction-reducing sheaves, state-of-the-art facilities in factories maintained by the company itself, Direct-Drive systems, single-point release locks and ALI certification. Look at the name on the column of that lift, and ask if your life and living is worth trusting to that name. If it’s a BendPak, we guarantee the very best product and quality at the most competitive rate in the industry. A two-post lift with no overhead beam, in order to maintain parallelism of the columns, needs to be carefully maintained. So sure, you can get away without the beam. BendPak’s XPR-12FDL is a floorplate model with no overhead beam. But again, this type of lift needs to be maintained more often, and more precisely. Imagine what happens to contact pads supporting a vehicle if the creep closer together as they ascend? Think loosened or improperly torqued anchors. 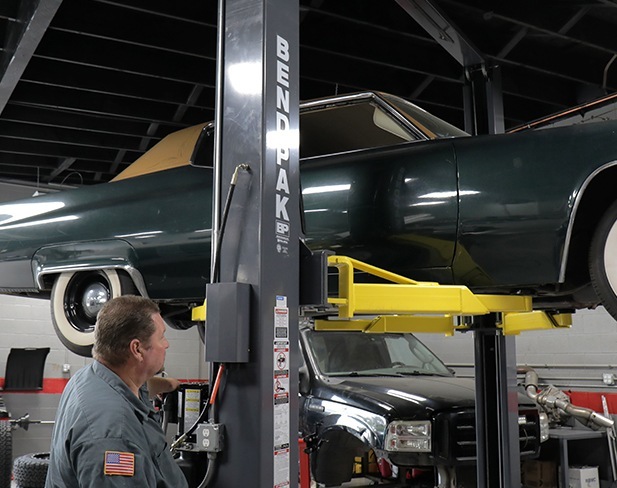 A low-ceiling garage might benefit from a two-post lift of this style, but more capable shops should consider whether they want to put the effort into maintenance during the lift’s many years of service. Companies that don’t offer lifts with overhead beams are not providing the versatility and choice you deserve. Powder coating is a process of coating steel electrostatically. Both powder and steel are given an electrical charge, which makes the powder stick to the steel. The powder is then heated and cured, so it melts around the steel and creates a heavy, powerfully bonded polymer. The result is a thick coating that’s extremely durable and far more protective than paint. Powder coating a lift is also time-efficient, environmentally safe and aesthetically appealing. The process is easy to replicate, so mass production of lifts is seamless and economical. Wet paint application, on the other hand, is a messy, complicated process that is more time consuming and results in more waste. Paint is preferred for objects that cannot be heat-treated or components that cannot afford the extra thickness that occurs during power coating. Luckily, these are not problems that come up with ​auto lifts. 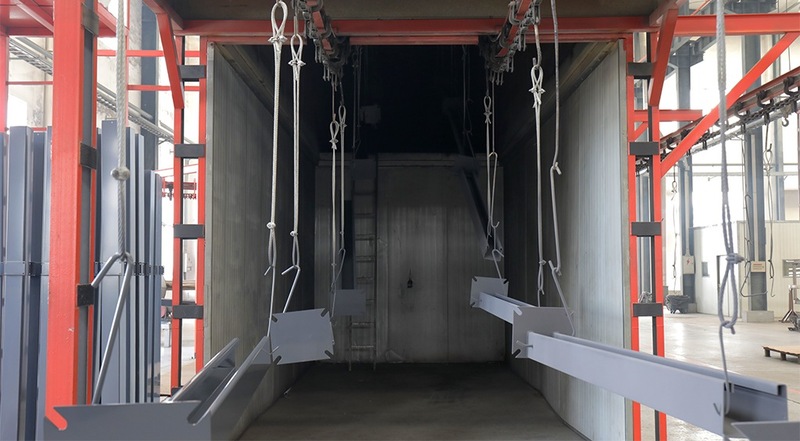 A painted lift likely comes out of an outdated facility or was made by a company that doesn’t sell a high enough volume to invest in powder coating equipment. 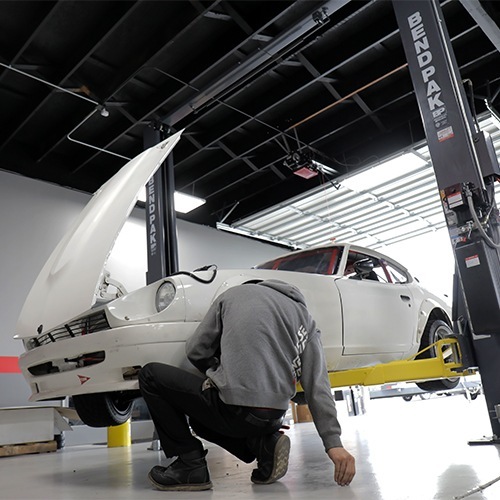 When it comes to car lifts, there’s no real benefit to painting over powder coating.